PVC decking boards Black Composite decking. PVC decking boards, e deck Black boards give any decking a fantastically clean and professional finish. 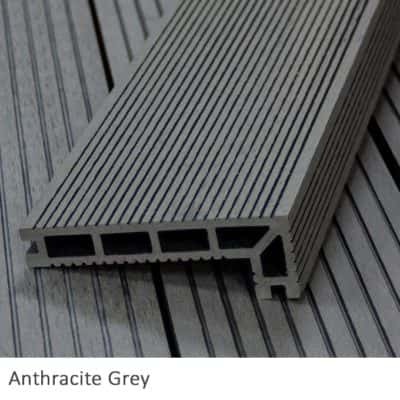 UN-like cheap composite decking prices our domestic grade board Made from plastic and wood that balances quality and price, the composite decking boards will not rot decay. 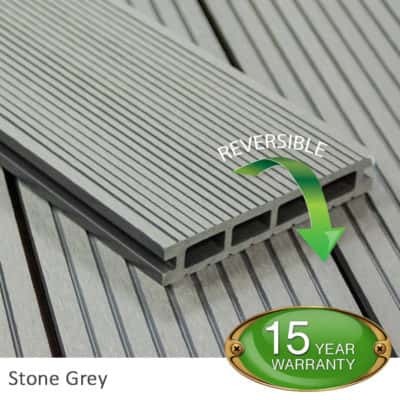 Designed against fading the decking has anti mildew properties and is anti slip even when wet. 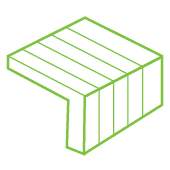 The full bodied colour means that the decking can be sanded down like traditional wood whilst maintaining its original colour. Also guaranteed is our amazing price which will not be beaten. In conclusion, If you have any questions or queries please feel free to get in touch. Our technical team are standing by and our time and advice is free. A different tread on each side of the e deck Black WPC decking boards. The boards have self-cleaning anti mildew properties and require virtually no maintenance for their life. And now with a choice of plastic or black stainless steel fixing clips are hidden to provide a truly high-end flawless finish. Can also be screwed directly to the supporting joists through the deck surface if preferred. Measuring 145mm x 21mm x 2.2m the boards once evenly spaced and fixed side by side, end to end to cover any size area. 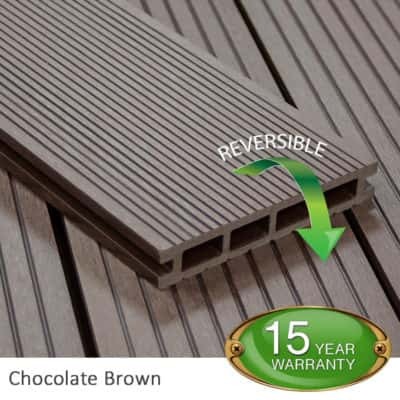 Composite decking also available in three other colours: Teak, Brown and Grey. And as the cherry on the cake. Why not take a look at our corner L profile trims and composite fascia boards both can still be used with e deck. Match them to your decking colour or mix it up a little. There are some fantastic examples of mixed decking out there and the possibilities are endless. 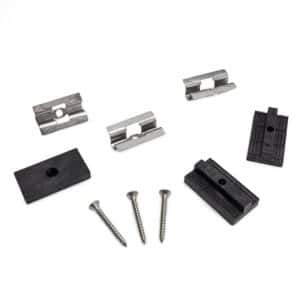 Also, our T-piece fixings will not only be concealed from view but give the decking a flawless finish.